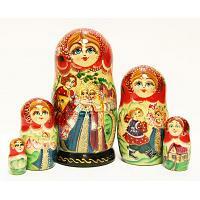 Handmade 5 piece matryoshka doll depicting a Russian accordionist and dancing ladies in traditional dresses. Materials: linden wood, acrylic paint, varnish. Height: 7 inches (18 cm). Production time: up to 7 business days. Imported from Sergiev Posad, Russia.